The environmental and economic advantages of compressed natural gas were understood by Soviet scientists as far back as in the 1930’s. The first CNG filling stations and NGVs were commissioned for regular operation in 1939. Italian engineers were introducing NGVs at the same time. Unfortunately before WW II the USSR could not execute effective NGV programs. The country returned to the NGV concept only in 1980. The national leadership had resolved to develop and implement a large-scale program aimed at massive substitution of oil-based transportation fuels with natural gas. By the end of 1990 the Soviet Union had built 357 CNG filling stations in all 15 republics. Cylinder and gas equipment production was launched. Compressor equipment was supplied by Russian, Ukrainian, German and Italian companies. In 1990 NGVs consumed 1 billion cubic meters of natural gas. In 1990 there were 350,000 NGVs in the former Soviet Union (FSU). Three major truck manufacturers – the ZIL, GAZ and KAMAZ plants – were selling OEM NGV trucks. Almost all types of light, medium and heavy-duty gasoline and diesel engines were reengineered to use natural gas. Cars, buses, trucks, railway engines, air and watercraft were using CNG and LNG. Agricultural and stationary engines powered by natural gas were also developed. In 1991 the Soviet Union gave birth to 15 individual states. Some of them have joined a regional international organization, the Commonwealth of Independent States. Six country members – Armenia, Belarus, Moldova, Russia, Tajikistan and Ukraine – kept their national NGV programs running. Now let us look at them, country by country, from the smallest to the biggest NGV markets. The number of NGVs and volumes of consumed CNG kept diving from 1991 through 2000. Increasing oil prices have since made natural gas more attractive and the Moldavian NGV market is now growing again. The price differential between gasoline, diesel fuel and natural gas is the major driving force. There is no dedicated NGV legislation in Moldova. However the price for CNG is favorable (0.18 €/ncm): 42% of diesel and 36% of gasoline prices. This is actually the only incentive for the drivers to switch on to natural gas. NGV related equipment – conversion kits, cylinders and compressors – are imported. Although Moldova does not produce oil or natural gas, CNG is becoming more popular. Since 1991, five new compressor stations have been commissioned. After 2000 the sales of CNG started growing and have reached the 1998 level of 14.2 Mcm. One may conclude that Moldavian NGV market is still to wake up though. Since 1991 Belarus has built five new CNG filling stations. All compressor stations belong to the ‘Beltransgaz’ company, which is responsible for gas transportation, underground storage and supply to the local distribution companies. All Byelorussian CNG filling stations are linked in to a single computerized data collection system. In October 2003 the Byelorussian Cabinet of Ministers approved a national NGV program, which aims to triple the number of NGVs by 2010 and build 44 new daughter stations. Belarus has OEM truck and bus factories and also produces agricultural and communal tractors. This could be a very fertile ground for the Byelorussian gas equipment manufacturer, the Novogrudok plant, which will definitely be part of the national NGV program. CNG retail price looks attractive (0.25 €/ncm): it is 60 % of diesel and 50% of gasoline. However there is a strong competition with LPG which is rather cheap in Belarus (0.22 € per liter). Sales of CNG for automotives were sliding down to 26.5 Mcm in 2002. In the past two years we have seen a small growth to 27 Mcm in 2004. The implementation of the national program will hopefully expand the Byelorussian NGV market. Unlike Moldova or Belarus the NGV market in Tajikistan is growing very fast. In 1991 there were only 3 CNG filling stations in that country. Now they have 53. Since 1998 – the worst NGV year for the country – the sales of CNG have increased by 23 times from 1.8 to 41 Mcm in 2004. Tajikistan has very small, almost negligible, oil and gas resources. Domestic oil and gas production covers only 1% and 4% of the national demand respectively. Despite this, prices for motor fuels in Tajikistan are at the same level as in other CIS countries. CNG costs 0.21 €/ncm. Tajikistan makes neither compressors, nor cylinders, nor gas equipment for CNG vehicles. All NGV related technologies are imported. The country brings in a lot of second-hand equipment. NGVs make up about 7% of the national on-road fleet. In 2004 an average Tajik NGV consumed a little less than 4,000 ncm per year, which is similar to other CIS nations. The Tajikistan NGV market will keep growing. Armenia. In the past seven years the Armenian NGV market has increased by 4.5 times. Today every 10th vehicle in Armenia runs on natural gas. Last year they consumed 110 Mcm of natural gas, approximately 4,000 ncm per vehicle. Armenia does not produce oil or gas. All mineral fuel is imported. Nevertheless, CNG prices stimulate the market: 0.26 €/ncm, which is 61% of diesel and 53% of gasoline. Since 1991 Armenia has built 42 CNG filling stations and today there are 47 compressor stations in that country. In 2003 there were 28,000 NGVs in Armenia. Current plans are to add 10 thousand NGVs every year increasing to a total of 78 thousand NGVs in 2008. A lot of equipment has to be imported in the near future to Armenia, because there is no domestic production of NGV related equipment. 78,000 NGVs is probably too bold a task. On the other hand natural gas is the only practical solution for a good deal of environmental and socio-economic problems associated with on-road transportation. One of the more urgent challenges for the Armenian government is to develop and enforce modern NGV legislation and regulations. Russia. Russia is the second CIS country in terms of sales of natural gas and NGV population. In 1998 a renaissance on the Russian NGV market began. The sales of compressed natural gas for vehicles grow about 20% every year. Last year 45 thousand Russian NGVs consumed 173 Mcm. Russian industry manufactures all types of NGV equipment for CNG filling, storage or use. However the growing demand could not be met with domestic products. CNG price is limited by the government and can not be higher than 50% of the low grade gasoline. CNG costs 0.20 €/ncm, that is 46 % of diesel of and 39% of gasoline. The price differential is actually the only market driver. Since last September we have been lobbying the federal government on alternative transportation fuels. The major role in the rebirth of the Russian NGV market belongs to Gazprom which was maintaining the network of filling stations, financing R&D, promoting the NGV philosophy among politicians and general public. 5,700 company vehicles out of 28,000 are NGVs. Ukraine. Ukraine is the NGV leader in the former Soviet Union. There are 145 CNG filling stations and 67,000 NGVs in the country. Ukraine holds the 5th place in the world in terms of CNG sales. Last year Ukrainian NGVs have consumed 550 million m3 which is more than in Germany or even in Italy. Ukraine is a well developed NGV nation. It manufactures cylinders, filling stations and gas transporters. Strangely there is no gas equipment production in the country. CNG price encourages the individual drivers and fleets to use natural gas instead of gasoline or diesel. Among other drivers of the NGV market is Federal Law on the use of alternative fuels and a National NGV program. Prices. The prices of CNG in the C.I.S. countries are significantly lower than prices of gasoline or diesel. The price differential is actually the only NGV market driver in this part of the world however, it has been a strong incentive in the past five years. CNG Sales. In my opinion the amount of CNG sold to NGVs is best market indicator. If there are no systematic official statistics about the NGV population one can not be sure about the accuracy of the real numbers of methane powered vehicles. What we have today are plus/minus estimates. I think that data about actual sales of gas are more trustworthy, because this information is coming from gas transportation & distribution companies. From that prospective CNG market in the C.I.S. is growing fast. Since 1998 Ukraine and Armenia increased the sales of gas to vehicles by 4 times. Russia has almost tripled consumption of CNG. 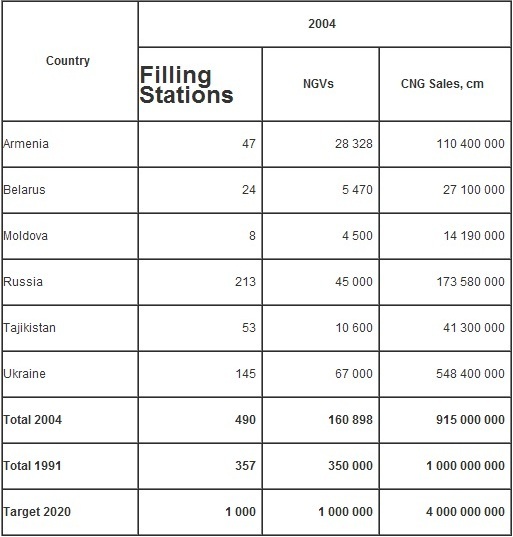 In 2004 Tajikistan has sold 20 times more CNG than in 1998. Belarus and Moldova are not that fast, but they are on the rise now. General market analysis. The cumulative data for C.I.S., presented below, convincingly demonstrate the growth of the NGV market after the disintegration of the Soviet Union. We have more CNG filling stations now and sell almost the same amount of gas to vehicles as 14 years ago. The table below indicates where we were, where we are and where we plan to be by 2020.